Liardon is President of Roberts Liardon Ministries and founder and Senior Pastor of Embassy Christian Centre, California. He is also founder of Spirit Life Bible College and Life Ministerial Association in Irvine. He is a worldwide recognised Christian author, public speaker, an influential Pentecostal spiritual leader, church historian and humanitarian. An author of over forty Christian and self-help books, Roberts Liardon published his first book, I saw Heaven, at 17. By the time he was 18, he was one of the leading public speakers in the world. At the age of 25, Roberts moved to Southern California to establish his worldwide headquarters in Orange County which would become a base for his humanitarian work, including assistance to the poor and needy in Southern California and throughout the world. 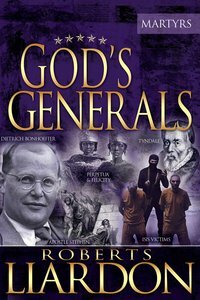 His other titles include God's Generals and Sharpen Your Discernment.- Publisher.